How Do You Spell Obsession? It is the sound that punctuates our day, "Nee-Naw. Nee-Naw". It is the colour, no longer known by its good and proper name, but simply referred to as "fire engine". It is how a stick, a dinosaur, a curtain rod, a camera, all turn into a hose shooting water. It is the ability to hear the distant tones of a siren, miles away and across the river and know instantly that it is a fire engine. It is love, pure and simple. Childhood obsessions are not new to me. I read everything I could get my hands on as a child, even spending one entire summer in my bedroom. My gorgeous niece, M, loved bugs unlike anyone I have ever met. She would spend hours chasing and collecting every variety of multi-legged beastie and bring them into show her less than thrilled mother. Her brother, spent years of his life lining up cars. My sis could even guarantee a quiet trip to the grocery store if a Matchbox car could make its way home with them. 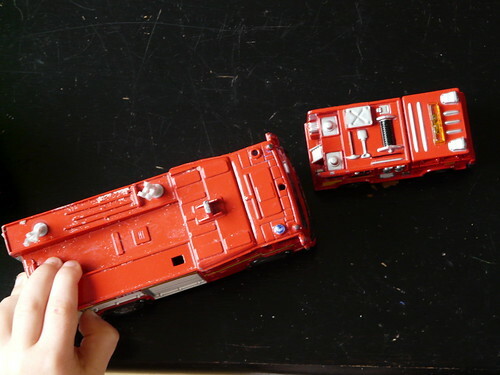 And so, I am not surprised with the smallest family member's obsession with fire engines. Well, maybe that its fire engines above all else. Trains, I can understand. He sees them, rides on them, reads books about them, even has a wooden train set, but fire engines are a bit out of the blue. There aren't many fires in a village of 300 people, or in the city of Stirling, for that matter. We don't even watch any fire-related television programmes (or any TV really) so I can only guess that it is his pure love and joy for these cherry-red emergency vehicles that fuels the obsession. And I don't mind it in the slightest. Don't we all need a passion in life, something that gets us out of bed in the morning and we look forward to in the evening?